The couplers were changed out first. 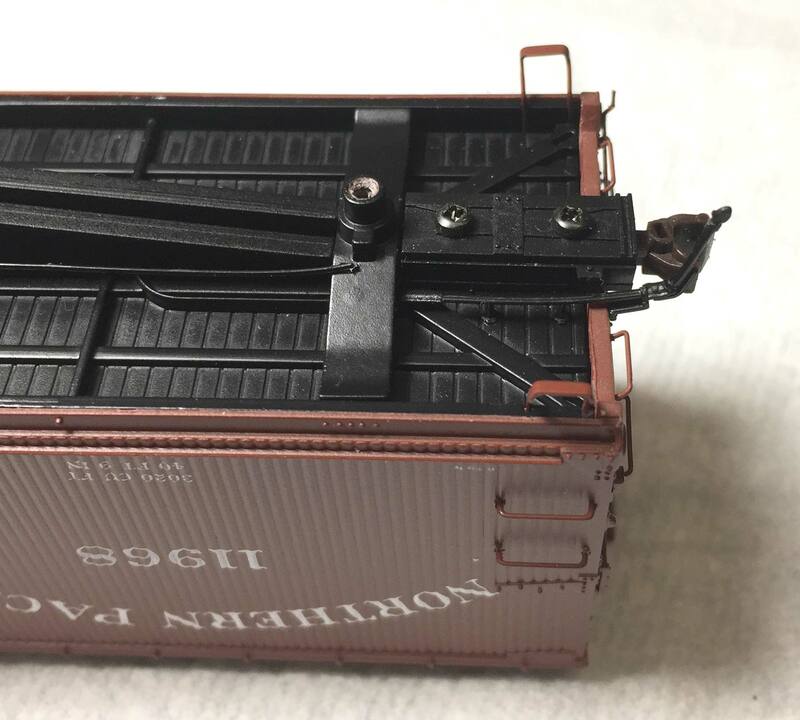 I use Accurail Proto:HO couplers with a scale gearbox. 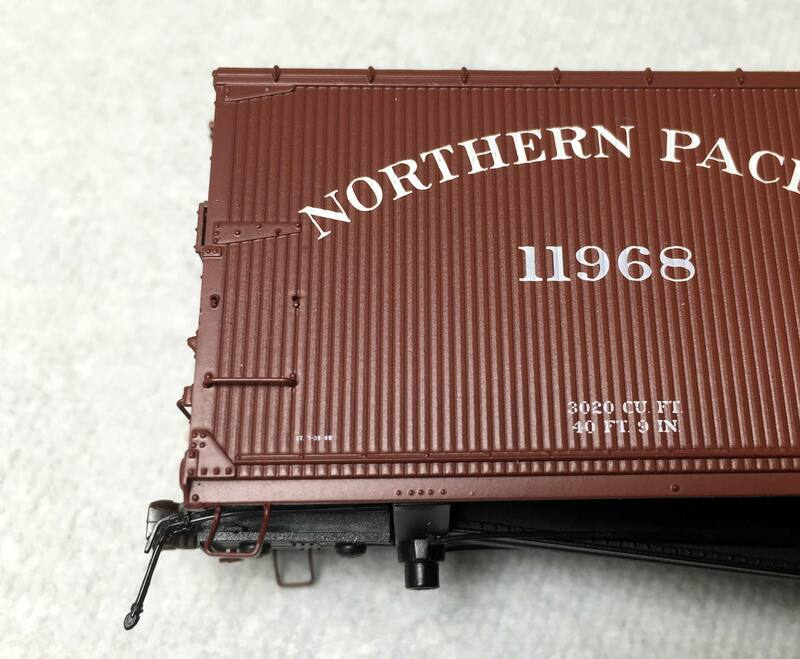 These have given solid performance during hours of switching activity on the Wheeling Freight Terminal layout. 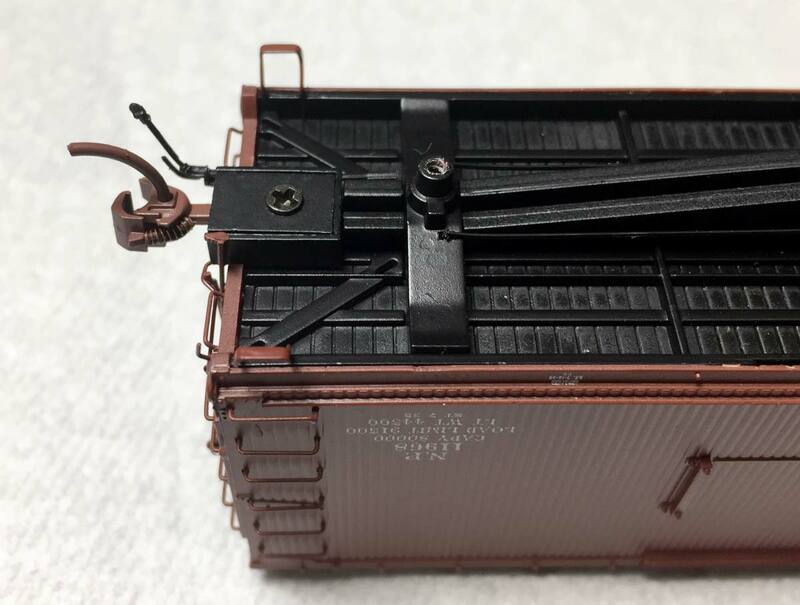 The OEM coupler box is easily removed with a small Phillips head screwdriver. A chisel blade removes portion of the underframe back to the bolster. The gearbox fits the space. The front screw is located over a keyhole for the original coupler box. A #55 drill bit was used to enlarge the hole for the Accurail mounting screw. The gearbox was installed with the front screw in order to mark the spot for the rear mounting hole. A couple of twists of the drill bit marks the location.The gearbox is removed, the proper hole is drilled, and the gearbox is installed with both screws. The next task is to remove the extra grab iron on the left end of the car sides. A toothpick was used to gently pry the wire detail part away from the model. Take your time and the part will loosen. Free up each end so a pair of pliers can be used to remove the grab. 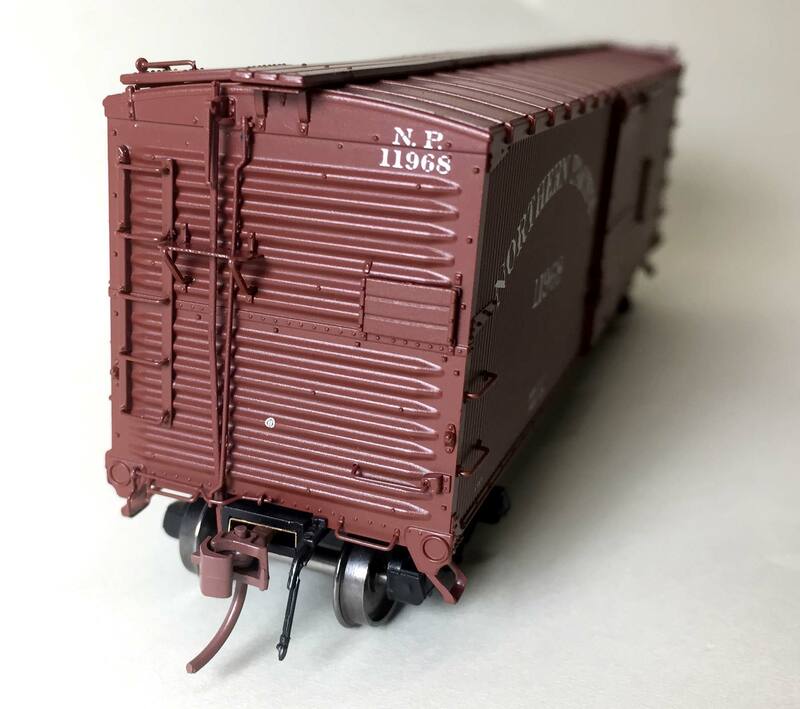 These second grab irons were mandated for all new and rebuilt freight cars starting in 1932. This is a simple removal for anyone modeling before this mandate. The bolt heads will be carefully sliced away then the hole will be filled with a short piece of styrene rod. You might need to enlarge the hole to accommodate the styrene you have on hand. As the computer updates had not finished, I decided to remove the running board supports. These were poorly installed and do not reflect prototype practice. The flat piece under the running board was carefully bent down and a small screwdriver was used as a lever to slowly remove the part. Once both legs start to move, a pair of pliers was used to remove the part from the car end. It takes a bit more force than you expect, so carefully hold the model while removing the parts. Once the running board supports were removed, the retainer and retainer line were carefully pried away using a toothpick. These details are one part and attached near the top of the end. The retainer line is oversize and will be replaced with 0.008-inch diameter brass wire. The wheelsets were replaced with semi-scale code 88 versions from Intermountain. I’m sure a few readers are surprised that I would remove details from a $50 ready-to-run model. 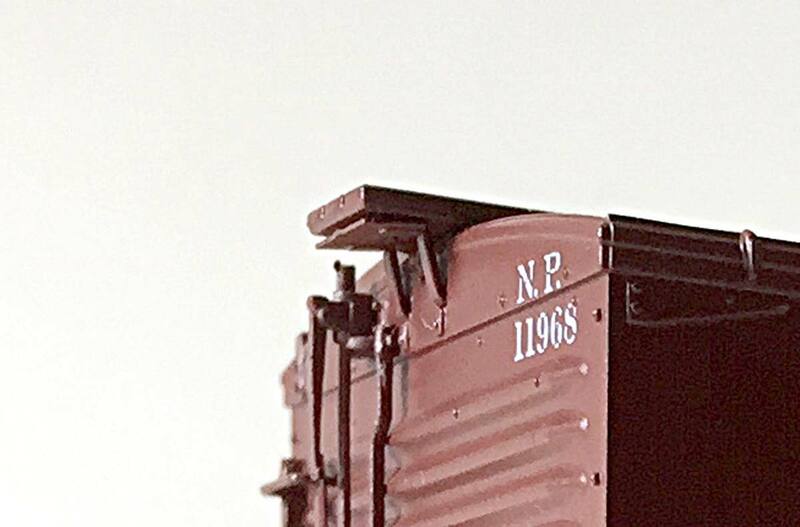 I want this boxcar to reflect the original look of the prototypes built in 1923. A little extra effort brings this model up to the detail level of resin kits. 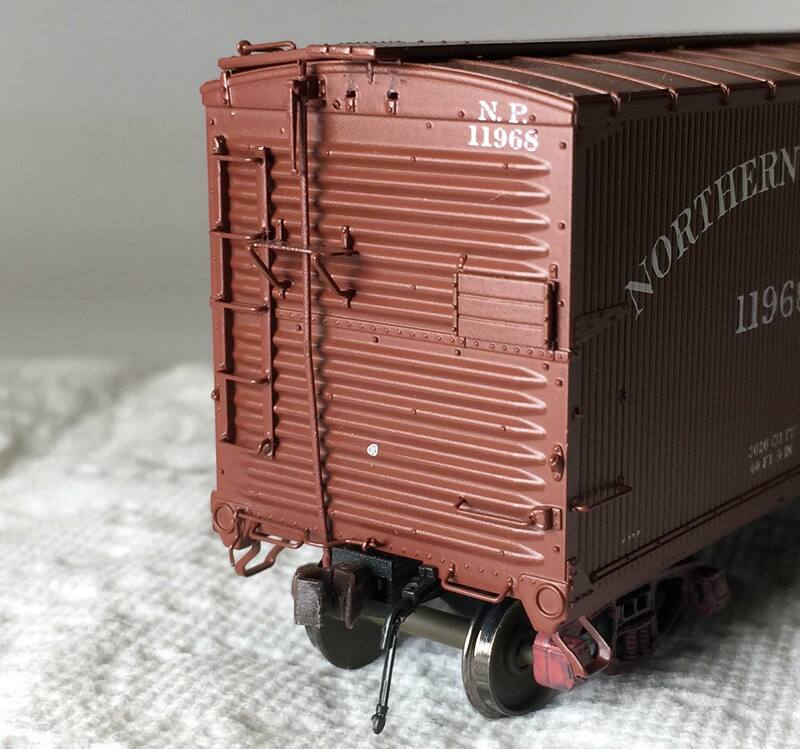 I’m not the only one who is making these Rapido boxcar upgrades. Ted Culotta has taken similar steps to upgrade his model and describes them on his blog. This was written in hope that a new computer would update and work. Well, it didn’t but these steps illustrate the ease of removing details in order to install finer details. 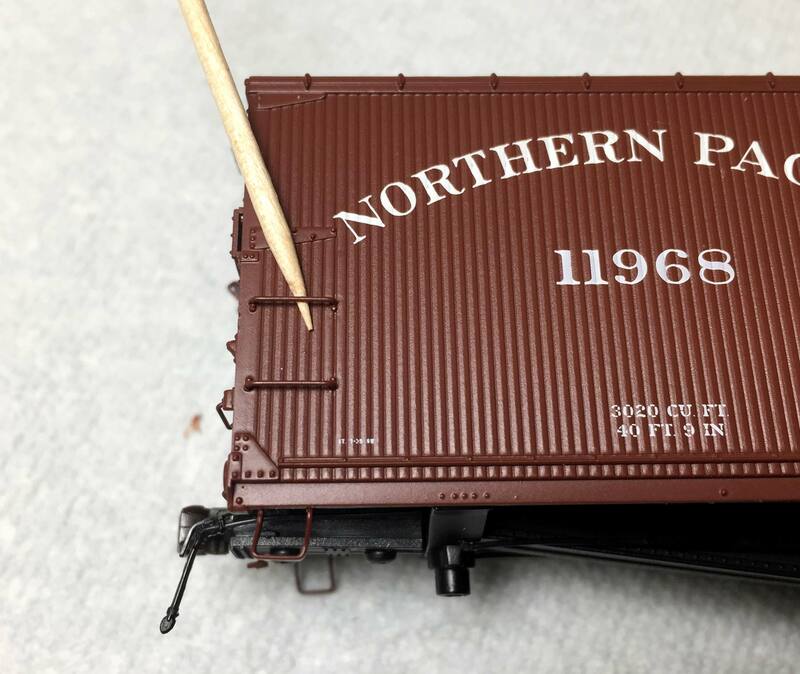 This boxcar work was one of the few bright spots of a crappy computer month. I returned the problematic new unit and purchased a new one, which is working great. Excellent blog post sir. I completely understand why you want to do this. I only have room for a small switching layout, so I decided to try and populate it with rolling stock and locomotives that reflect the time period I want to portray (1942-45). That means I’m going to go with more detailed models. I look forward to seeing more of your blog. I substitute flat head 00.90 screws for those supplied by Accumate (or Kadee #711) It takes more time filling, drilling and tapping but the flat screw heads look much better.